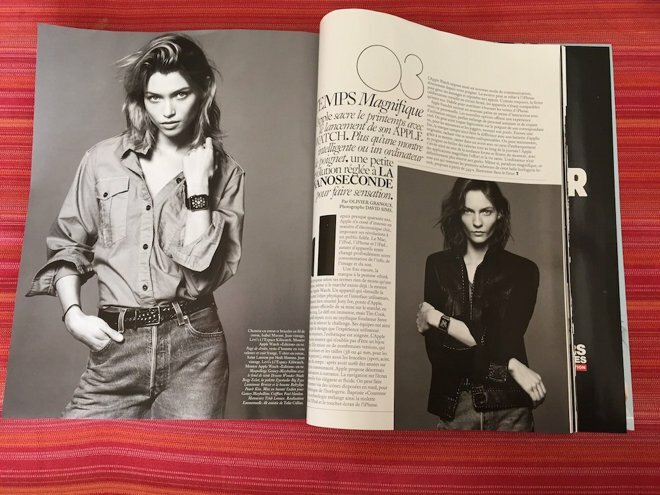 Apple's marketing blitzkrieg for the upcoming Apple Watch has made it to the pages of Vogue Paris, with the latest edition of fashion's holy scripture blessing the new device with a two-page spread that calls the Watch "a small revolution" ready to impress. Boding readers "welcome to the future," the spread discusses the Watch's importance at post-Steve Jobs Apple and its overt positioning as a fashion accessory. The story —first noticed by French blog PomPomComedy —is bookended by photos of fashion models donning the gold Apple Watch Edition. Apple has begun to ramp up advertising for the Watch in advance of its expected April release, specifically targeting fashion-conscious buyers. 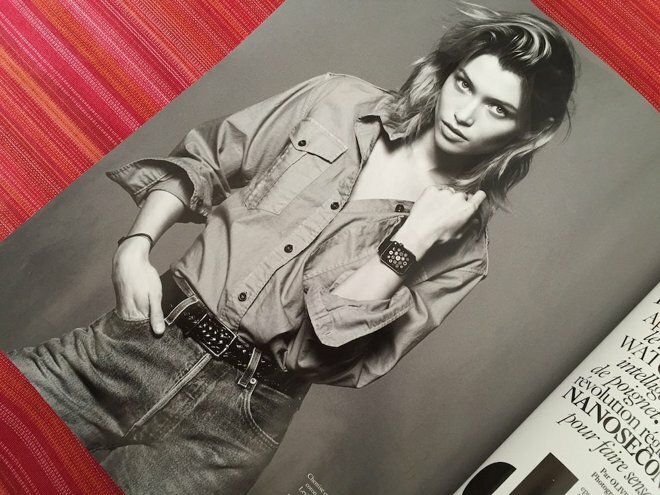 The March edition of American Vogue hit newsstands with a 12-page advertisement for the new gadget. That spread included close-up views of the hardware and swappable bands, and was joined by a special digital version of the ad in Vogue's iPad edition that gave readers a 360-degree view. Victoria's Secret Angel Candice Swanpoel can be found wearing the Apple Watch Sport on the latest cover of women's lifestyle magazine Self, and Apple is also thought to be planning a major retail push in high-end department stores. That initiative apparently includes a space in Paris's upscale Galeries Lafayette. Earlier this week, Apple announced a "Spring Forward" event on March 9 at which the company is expected to reveal the Watch's final release data and nail down specifics related to its battery life, water resistance, and pricing. AppleInsider will bring live coverage of that event as it unfolds.